Strawberries and Cream Smoothie Pops are the perfect way to get your kids excited about breakfast. A tasty, simple smoothie turned into a cream frozen treat. Does anybody else have a child that takes 30 minutes to eat a bowl of cereal? Breakfast is a real struggle around here so I’ve been on the hunt to get these kids motivated to eat before we run out the door for school. I found it with these Strawberries and Cream Smoothie Pops. You want to get your kids to eat breakfast without complaining or taking literally all morning? Tell them they can have a popsicle. It works my friends. Every time. It feels like you’re breaking the rules and that’s pretty exciting for a kid. Or an adult for that matter. When I bit into one of these I know I’m eating something completely healthy but when it’s frozen and on a stick it feels fun and wrong in all the right ways. I mean, they even motivate me to eat breakfast (which I skip waaaay too often otherwise). You can take any fruits you love to create your dream smoothie pops, just keep the same amount of fruit to liquid ratio. I went with strawberries and cream since it’s a family favorite and all you parents out there know you go with what all the kids like. 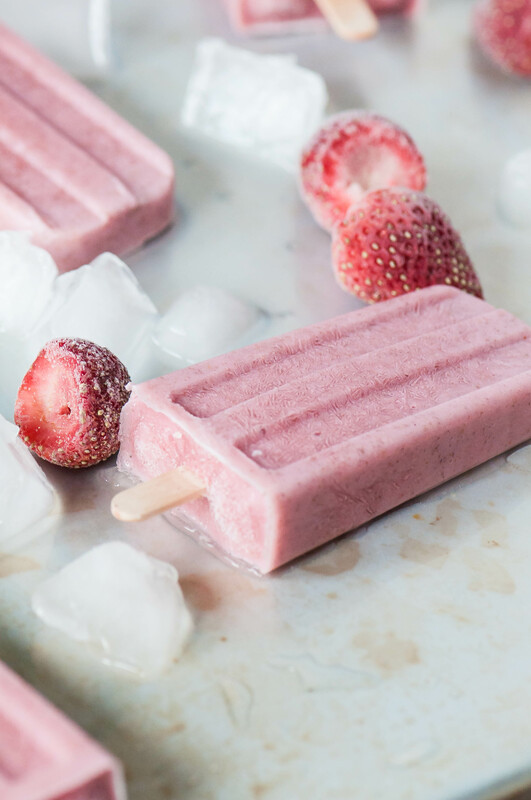 These pops are jam packed with frozen strawberries, Greek yogurt for protein, honey for sweetness, vanilla almond milk for flavor and to smooth them out and an extra punch of flavor with vanilla extract. If you use regular milk, go ahead and add an extra teaspoon of vanilla extract to drive that vanilla flavor home. The honey is optional. If you like things a little sweeter, go for it. If the strawberries add enough sweetness for you, skip the honey. You do you. Turn any of your favorite smoothies, like this one or this one, into smoothie pops for a ridiculously simple and fun breakfast or healthy late night treat. Add all ingredients to the blender and blend until smooth. Pour into popsicle mold and add sticks. Freeze for at least 6 hours.